We prove an affordable collection of beautiful vanities for new homeowners and home remodel projects. Found our product cheaper from another retailer? We will do our best to match their price. See our Price Match Policy. Fastest shipping times in the industry. See our shipping times. We have a massive selection of different bathroom vanity sizes, colors, and styles. 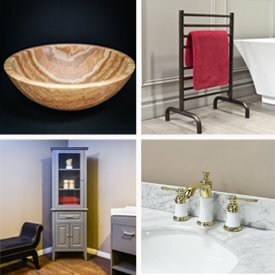 Check out our Bathroom Vanity Guide. We try our best to guide you through the process of your order until the moment you receive it. Our representatives have many years of combined experience and can help answer any of your questions. All products sold by us come with a manufacturer's warranty. We offer cabinets, storage cabinets, sinks, faucets and more so you can personalize your bathroom. We provide products with easy installation such as Virtu USA vanities . The main cabinets from Virtu USA are pre-assembled and only the countertop and sink need to be installed. If you have any questions or concerns, contact us or call us at (800) 574-3022 to speak with a representative!